Why Has The Popularity of Lexapro Taken A Nosedive? This entry was posted in Substance Abuse and tagged Prescription Medication, Signs and Symptoms, Stimulant on August 18, 2016 by Team Addiction Hope. In the summer of 2011, the prescription antidepressant Lexapro accounted for more than $720 million in sales in the United States. By early 2013, that number had dropped dramatically – and it hasn’t seen a rise since. One of the most prescribed antidepressants in the country has taken a nosedive in use and sales. Why? In 2002, Forest Laboratories released what it thought was an innovative new medication for the treatment of depression, Lexapro. It was an upgraded version of Prozac, a drug that had been a game-changer for depression issues in the 1990s. Though Prozac brought relief to thousands of people, the side effects of the drug were still difficult for many to manage. Lexapro offered depression sufferers fewer side effects without compromising effectiveness. Its manufacturer made nearly $14 billion in earnings in the drug’s first decade, more than half of the total sales for the entire company. The number of antidepressant prescriptions was growing wildly in the 2000s, meaning Lexapro had its chance to cash in on the trend. In fact, in 2009, physicians wrote 169 million prescriptions for different varieties of these medications. 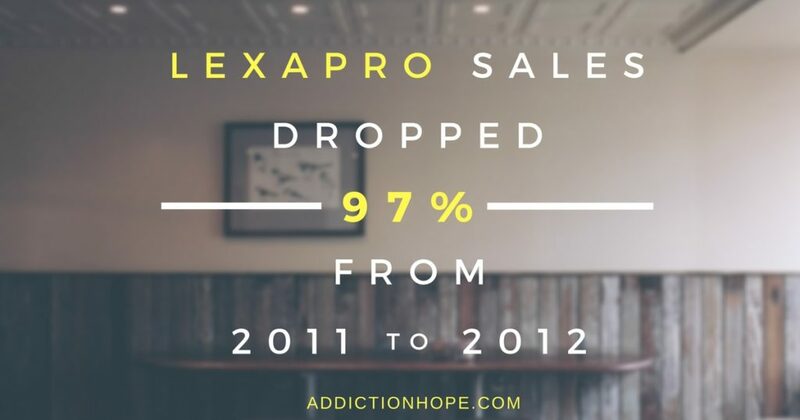 Lexapro consistently held a steady spot in the top 10 list of the most-prescribed drugs in the country, and it seemed like it would join the ranks of Xanax as a widely used and reliable treatment for mental health issues. As with any prescription drug, the patent protection for Lexapro expired. Forest Laboratories no longer had exclusive rights to the drug, and any company could freely produce a generic version of the medication beginning in March 2012. This meant an instant surge in competition for the company. Profit losses are always expected during situations such as these, but in this particular case, the drop had a much stronger impact. In fact, the single most influential thing that happened to Lexapro was the release of a generic version, escitalopram. This drug was made available in early 2012, offering the benefits that patients had come to expect, but at a much lower cost. There was a resultant 97 percent drop in sales for the brand name pill from by the end of 2012. Forest Laboratories’ profits fell from $600 million per quarter to just over $20 million in one quarter less than a year later. Ouch. As if competing with generic versions wasn’t hard enough, the pharmaceutical company that created Lexapro has been slammed with multiple lawsuits in recent years. Although they vary in size and impact, each lawsuit has eroded the use of the drug, and, in turn, the company. The two largest claims that the company has had to deal with are improper marketing and birth-defect accusations. With other antidepressants already on the scene, many claim that Forest Labs wanted to speed up the process of establishing its own pill. The company was aggressive, and some suggest it used illegal methods to boost the use and publicity of its headlining drug. Reportedly, the company’s launch plan even included compensation for specialists who prescribed the drug. After investigation by the U.S. Department of Justice, things only got worse. The DOJ accused Forest Labs of unapproved marketing, paying prescribing doctors and failing to reveal negative results in trials. The company settled for $313 million penalty in 2010. A matter that has not yet been resolved for the company is the link between Lexapro use and birth defects. The drug was marketed as safe for pregnant women, but it appears to actually lead to serious complications. Birth defects from Lexapro use reportedly range from autism to spina bifida to cleft palate. Autism in particular is a focus of many lawsuits, as a recent study determined that this type of antidepressant medication can cause a 200 percent increase in the prevalence of the disorder. Numerous groups have filed for damages, and some analysts claim that the settlement will be greater than $1 million for each family affected. The estimated total for a lifetime of education and care for an autistic child, however, is around $2.4 million. The Food and Drug Administration agrees that there are no risks of physical addiction with Lexapro, but that doesn’t mean that the mind can’t become accustomed to it. One reason people may be steering away from use of the drug is because they don’t want to feel as though they need the medication to function every day. Though Lexapro doesn’t have issues with dependency, users should never quit completely without discussing it with their physician. Additionally, a unique symptom for Lexapro withdrawal is the feeling of electric shocks in the brain. This frightening side effect could cause increased anxiety and irritability. Although Lexapro was once widely prescribed as an answer to depression, there are many reasons why the drug has so quickly dropped in favorability. From its higher cost to reputation-damaging lawsuits, the concern is all too real. What are your experiences with taking or seeing a loved one use Lexapro?